Economics: Dismal Science or Powerful Dogma? Since the summer of 2012 Burma has seen pogroms, massacres, riots of unprecedented scale against religious minorities, the latest being on the 30th April. Few hundreds have been killed and few hundred thousands have been rendered homeless. Much has been talked about how it is a ploy by the hardliners in the army and the post-reform government to stall further reforms. It might be true to a large extend, but the silence of the pro-democracy opposition is intriguing. While many from the “pro-democracy” camp has remained either silent or ambivalent; many others have shown that they actually belong to the ranks of fundamentalist who in the pretext of unfounded “sense of self-victimization” are fomenting a near genocidal situation in the country. The non-sectarian democratic forces within Burma would do a service to the country and to the world, if they can use their hard-earned moral authority to put a stop to the riots from turning into a full blown genocide. It is high time that all of us understand and recognize religious fundamentalism as a social reaction with fascist potentials and it must be unequivocally opposed and confronted. On 30th April, in a small town called Okkan, 100 kms away from Rangoon, a Muslim woman on a bicycle bumped into an 11 year old Buddhist monk who dropped his alms- bowl, damaging it. Soon a Buddhist mob gathered and went on a rampage killing at least one person and destroying several mosques and torching Muslim owned poultry farms and houses. The authorities later detained 18 people allegedly involved in the riot, including the woman who was involved in the accident with the young monk, accusing her of deliberate and malicious acts that insult religion. Rangoon’s Deputy Police Commissioner, Thet Lwin, while admitting that she had bumped on to monk by accident, told Reuters that “According to our practices, we need to send her for trial since she was involved in the root cause of the incident” and that it was up to court to decide her fate". Since this latest incident of anti-Muslim riots, it has been reported that Muslim villages have erected bamboo fences around their villages and armed themselves with clubs and swords to protect themselves from possible attacks from the neighboring Buddhist villages. On 20th of March, a Buddhist woman got into an altercation with the Muslim owner of a gold shop over the price of a gold hair pin in Meikhtila town of Mandalay Division. According to reports, during altercation the Buddhist woman was slapped by the shop owner and her husband thrashed by the staff working in the shop. Soon a mob gathered and started attacking Muslim owned businesses nearly destroying most of them. That very evening four Muslim youth killed a Buddhist monk in an alleged act of revenge. From the late evening of 20th March, much of the Muslim dominated wards of the town were engulfed in flames. In the following 5 days, a Buddhist mob led systematic pogrom against Muslims ensued which spread to 15 other smaller towns resulting in numerous charred bodies, buildings and mosques. According to official report at least 43 people were killed and several hundreds injured. 13,000 people, in Meikhtila alone, have been forced into refugee camps guarded by para-military troopers. This rounds of anti-Muslim riots in March and April are a bloody reprise of last year's massacre of Rohingya and Kaman Muslims in the western State of Rakhine where, accordingly to official estimates, 110 people were killed and 125,000 people were forced to flee to refugee camps. In the last week of April, BBC released a video footage of Meikhtila riots in Central Burma where Buddhist monks in saffron robe can be seen leading the murderous mob while police stood by as onlookers. Various reports have also appeared that hints at State complicity, if not direct involvement, in the recent rounds of anti-Muslim riots. The Government has denied that security forces indulged in killing Rohingyas and Kamans in Rakhine in 2012, it has also denied that security forces stood by while people were being butchered and buildings were be torched in the Meikhtila riots. Official communiqué has claimed that security forces were overpowered by mobs in terms of their sheer numbers. As has been question by various close observers, these claims defies logic that a security apparatus that has so ‘efficiently’ and brutally suppressed various widespread uprisings during the 40 years military dictatorship, suddenly lost their nerves to be able to control riots. Even though several dozens of people have been arrested for the Central Burma anti-Muslims riots of March and April, they have failed to convict the perpetrators citing lack of evidence except for 3 Muslims. If the State machinery had the will they could have brought the violence under control without much loss of live and material. In fact senior army officers and government officials have been quoted on various occasions since last year expressing unfounded fears that Muslims would force their religion on Buddhists and try to “steal” Buddhist women. In reference to Rakhine, a senior minister is believed to have said that if “they” are not deterred, the western gate will break (an obvious reference to the border with Bangladesh) and that human rights don’t apply to Muslims. In an infamous episode, drawing comparison between the “dark brown” complexions of the Rohingyas with the “fair and soft” skin colour of the majority of Burmese population, the Burmese Consul General in Hong Kong, U Ye Myint Aung, wrote a letter to local newspapers and other Diplomatic Missions in which he described Rohingyas as “ugly as Ogres”. Many liberal commentators from among the Burmese Diaspora have located the roots of the anti-Muslim riots in the challenges that the ruling elite faces in the post-reform era. An US based Burmese political scientist, argues that “supporting anti-Muslim extremism could help encourage a multi-ethnic conservative alliance among Buddhists and establishment forces. State media’s embrace of anti-Rohingya propaganda bolsters this idea, and has helped the violence spread beyond its origin in Rakhine state”. He elucidates, that in post-reform era where the army has lost some of its power, it faces a big challenge of re-consolidating by integrating former insurgent fighters from the Chin, Karen, Mon and Shan minorities into the forces, all of whom are mostly Buddhist but hold bitter grievances towards the country’s majority ethnicity - Burmans. Similarly, he opines, Burma’s top politicians (with ties to the older dictatorial regime) need to assemble a ruling coalition in the Parliament. But “unfortunately” for them, Aung San Syu Kyi’s NLD has stronghold in the Burman dominated area. So, creating a common Buddhist enemy, ie; the Muslims, is in the interest of both the army and the politicians (ex-military officers). These explanations stand some ground, but remain unconvincing on many accounts. It doesn’t take into cognizance the fact that the history of post colonial Burma coincides with the history of systematic persecution of Muslims. It fails to even mention the indirect and direct role played by various Buddhist monastic associations in the riots. And it absolves Aung San Syu Ki, other pro-democracy activists and rights activists in Burma of any ethical responsibility. However, it was after the coup of 1962 that State-sponsored persecution of Muslim started. General Ne Win and the military junta that replaced him played the religious ultra-nationalist and racist card to manipulate the masses for the entirety of the dictatorial regime. Muslims and other non-Buddhists were barred from the upper echelons of the army and, almost immediately after Ne Win's coup, he expelled hundreds of thousands of Indians from the country. He also fostered a sense of a Burmese identity strongly linked to Buddhism, which has been the breeding ground for waves of anti-Muslim violence. The military regime in Burma, since the early days of General Ne Win, has used xenophobic violence as a tool to bolster its own interests and legitimacy, apart from the 1967 anti-Chinese, it has mostly been anti-religious minority in character. In 1978 Operation Dragon King was launched which resulted in more than 200,000 Rohingyas crossing over to Bangladesh as refugees; in 1982 Rohingyas were disenfranchised under the amended Citizenship Law. In 1997, the regime, allegedly, used rising anti-Muslim sentiments and incited riots to deflect criticisms of the regime’s pro-China policy (and “State complicit” influx of Chinese nationals into upper Burma). In 2001, the regime’s own mass front Union Solidarity and Mass Association was accused of inciting anti-Muslim riots in Taungoo. However, the iron fist of the authoritarian regime in Burma, like any other authoritarian regime, was also capable of preventing and controlling riots if it was not necessary for its own advantage. A case in point is the 2003 riots which was brought under control rather swiftly, and U Wirathu (by now an infamous hate spitting Buddhist abbot) was sentenced for 25 years and put behind bars for inciting anti-Muslim riots (he was released in 2010 in the general amnesty that was granted to prisoners). In late 2012, Letpadaung region saw eruption of massive protest against a controversial expansion of a copper mining project. More than 3,100 hectares of land have been confiscated to make way for the one billion US dollar expansion of the copper mine, run by Myanmar Wanbao Mining, a joint venture between the Myanmar military and a subsidiary of a weapons manufacturer, China North Industries (Norinco). In November, 2012, the security forces resorted to tear gas and smoke bombs to disperse the determined protesters who had surrounded the mines for months. For those (in power corridor) who wanted to deviate attention from the Letpadaung episode, the recent riots were a blessing. It is no longer simply a state-sponsored project. The State might still try to reap harvest out of riots, its soldiers might help the mob to kill the “enemy”, but its no longer in a position to dictate when, where and against whom riots should take place. Once the restrictions and censorships loosened in the post-reform period, the progeny of the seeds of xenophobia that was sown into the monasteries, schools and society at large for the benefit of the military regime is beyond any authority’s control. The xenophobic campaign now is out in the public and is transnational in character orchestrated openly on social media websites. The Human Rights Watch report gives detailed accounts of the role played by Buddhist monastic association in the last year’s pogrom in Rakhine state. 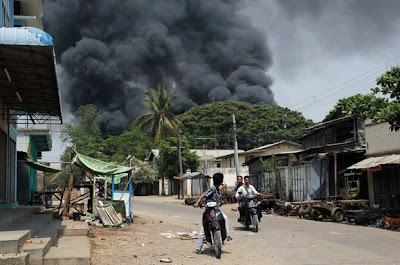 Various reports from the affected areas in this year’s riots in Central Burma have detailed the leading role that monks are playing in the riot (which is corroborated by the video released by BCC in late April). Burma’s Buddhist monastic order, the Sangha, drew wide spread admiration from the international community for the peaceful pro-democracy uprising against the military regime in 2007. But the same Sangha now finds its reputation put to question by reports of saffron-robed monks playing a lead role in the riots. While the Sangha vouches by peace as a central tenet of Buddhism, their approaches to the recent riots have been less than consistent. Thitagu, a prominent abbot, in an interview with a Burmese magazine Voice weekly said that “In ethnically diverse Burma, members of different religions should live together like water flowing together” . But in the same interview Thitagu warned that “just like the Buddhist host has warmly welcomed other faiths into the country, the guests should strive to get along with the host. They should not trespass on the host’s goodwill and take over the home”. However, in the centre of attention is U Wirathu, the abbot of Ma Soe Yein monastery in Mandalay, who heads 25,000 monks in his monastery. U Wirathu, with much pride, has called himself the Bin Laden of Burma. Early this year he launch the 969 campaign; and claims that the movement draws upon the nine attributes of Buddha, the six attributes of Buddha’s teaching and nine attributes of the Sangha; and hence 969. The campaign urges Buddhist not to transact with Muslims economically or socially, and demarcate their houses and properties from Muslims by putting up the emblem of 969. 969 stickers have made its way to numerous shops, taxis, buses and houses in several towns and cities. Since the launch of the campaign, in U Wirathu’s own words, the movement has reached far and wide with its formidable stronghold being in Rangoon, Mandalay, Moulmein and Sittwe. DVDs of U Wirathu’s anti-Muslims vitriol are in widespread circulation, his anti-Muslim sermons on youtube has been watched tens of thousands of times and has thousands of followers on facebook. Even though U Wirathu denies any involvement with the recent anti-Muslim riots. But as was the case in the anti- Rohingya Muslim pogrom where words and unfounded rumors preceded the bloodbath, various observers strongly believe that U Wirathu’s anti-Muslim vitriol did play an important role in the recent riots. One of the disappointing facts that has emerged during the Rakhine pogrom and recent riots in Central Burma has been the clouded reaction of the pro-democracy opposition. Many, including Aung San Su Kyi, has remained either silent or ambivalent. Many other pro-democracy activists have openly sided the fundamentalist elements responsible for the mayhem. Ko Ko Gyi, a prominent pro-democracy activist who spent years in jail for his lead role in 1988 student uprising says that Rohingyas are terrorists and is infringing upon Burma’s sovereignty. Another pro-democracy activist and former political prisoner is quoted as stating that “if western nations really believed in human rights, they would take the Rohingyas from us”. Thousands of others from the Burmese diaspora in Australia, US, Canada, UK and other European countries have jumped on to the bandwagon of hate mongering. Many among them are pro-democracy and human rights activists who escaped during the military regime as refugees and to seek asylum in these countries. Aung San Su Kyi, who is seen as an icon of peace and quest for democracy the world over, has maintained utmost silence on the anti-Muslim campaigns and killings. Instead of outrightly condemning the pogrom against Rohingyas last summer, she commented on Radio Free Asia that people should restrain themselves and should not fight among themselves. This, by any standard, is a gross insult to the 110 dead and 125,000 displaced people. In regards to the recent riots in Central Burma, she has called for rule of law. U Wirathu, the hate-spitting Sayadaw (venerable teacher), in one of his anti-Muslim sermons, urges his followers to be patriotic and to think about long term outcomes and not be lured by short term gains. 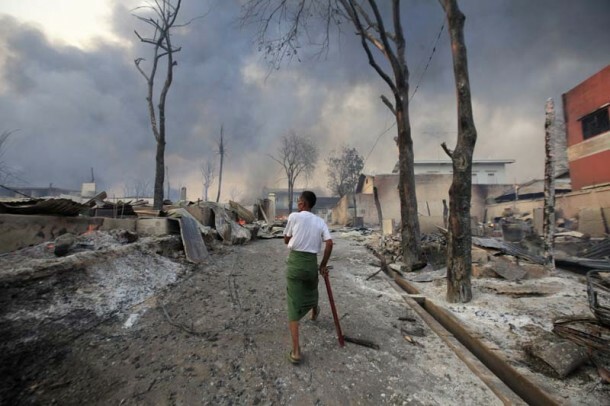 The non-sectarian democratic voices within Burma urgently needs to urge Aung San Su Kyi the same and use her moral authority to put a stop to the riots from turning into a full blown genocide, lest the country slides back into history by another 50 years. Bonojit Hussain is a Delhi – based independent Researcher, and an activists with New Socialist Initiative (NSI) .